The BARTEC PIXAVI Impact X NC (No Camera) intrinsically safe smartphone has all the main functions which you would expect a smartphone to have, apart from a camera. The IECEx and ATEX Zone 1 certification has not affected the quality and usability. The device is explosion proof and highly recommended for use in hazardous areas. This is the only smartphone which is designed so that it is completely impossible to capture images and videos when using the device. The Impact X NC smartphone is extremely powerful and has the most up to date processors and software, as well as ATEX and IECEx Zone 1 certification which makes it one of the most adaptable smartphones on the market. The device is free from outdated technology and bulky form factors which tend to put customers off when purchasing a smart phone. 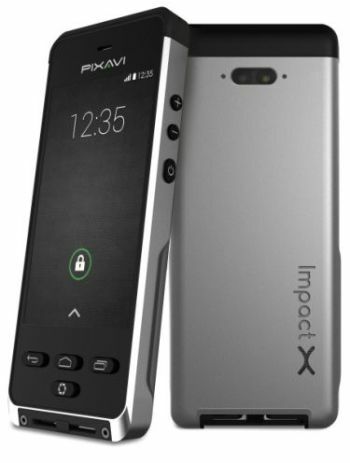 The Impact X also has some added features which no other smartphones have. The device's battery lifetime, ruggedness, usability, sunlight readability and glove compatibility make it perfect for use in hazardous environments. The Impact X NC was developed in cooperation with Shell and other leading O&G operators. Bartec have designed this product based on 13 years of experience and also in cooperation with end users and their needs. The smartphone has many newly improved features, such as a moisture immune touch screen, ergonomic grip, anti-smudge coating on glass, dedicated buttons and is extremely light. The smartphone comes with Collaboration X Mobile device management which enables the user to easily manage and maintain the mobile devices from a network administration point of view. This solution allows the user to set security policies, access control, network policies and other settings as well as removing all the data from devices if they are lost or stolen. Collaboration X gives the user secure control over multiple devices connected by the same network. The Impact X NC has advanced technology which ensures that the camera can function efficiently on a low power consumption and also has double the battery capacity, meaning that you can get a full days use without having to recharge. A 3000mAh battery ensures many active workdays of power. The aluminium chassis, sunlight readable display, extra memory capacity, rugged strap mounts and gorilla glass is designed specifically for the end user. The Bartec Impact X is impact, drop, dust, corrosion, water and explosion proof, making it one of the most rugged and sturdy devices on the market. The phone can also withstand extreme temperatures and is easily readable in the sunlight. Android devices are secure, stable, updated and offer the user a massive library of applications to choose from. Bring any app into hazardous areas, including a wide range of value adding applications and services, such as mobility and ERP solutions, device management, video conferencing applications and every other Android app. Android ensure that there is the same quality and performance in their enterprise apps, just as there is in all their other apps. The custom-built video conferencing application called "SIPIDO", allows the user to stream live video conferencing sessions from the field. This saves a lot of time and money! The Impact X chassis is machined from one piece of high quality Norwegian aluminium, which is rugged and very durable. The rubber details and tough exterior make it one of the toughest smartphones ever created. The impact X can be mounted on a wrist cradle for hands free operation when in hazardous and hard to access areas.